UO to give students $450K in need-based scholarships! 8/13/2013: Just kidding, that’s how much Athletic Director Rob Mullens is paying the Nicholls State University Colonels football team to show up in Autzen and lose to the Ducks, 4 weeks before the UO students even show up for classes. Vegas has Oregon by 51 points. College sports at its finest. Sam Stites has the story in the RG. Meanwhile VPFA Jamie Moffitt says UO’s budget doesn’t have any more money for faculty raises, while President Gottfredson still hasn’t done jack about the UO Senate resolution calling for him to end the subsidies for athletics, and start redirecting some money to academics, starting in the fiscal year that began 7/1/2013, and send money for need and merit scholarships, starting 7/1/2014. Moffitt piles on more reserves, still not enough for raises. 5/19/13: From http://ous.edu/state_board/meeting/dockets, the March 31 Quarterly Management Report. Free UO Matters coffee cup to UO Controller Kelly Wolf if he will explain the extra $99M in income that popped up this year. Anyway, it looks like reserves were up again last quarter. 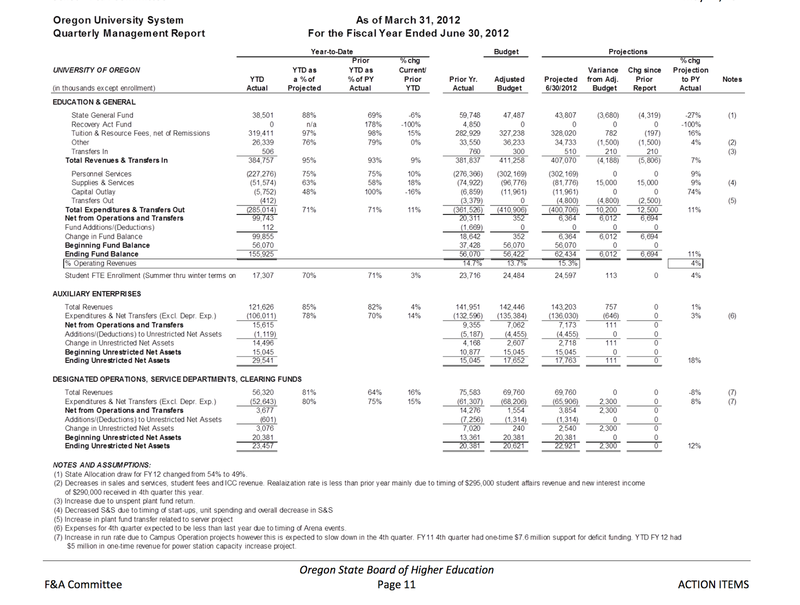 In March Moffitt walked out on the faculty bargaining team when they asked her about UO’s reserves, 15.8% at the time. She stalled and came back a few weeks later, saying that was if anything too low – even though OUS’s recommended upper limit is 15%. For a comparison, OSU’s reserves are 8.4%. That means UO has about $63M more than OSU squirreled away for a rainy day. I’ve met OSU’s former VPFA Mark McCambridge, who just retired. He struck me as a fairly prudent fellow. (And, in contrast to Moffitt, a strong believer in transparency.) 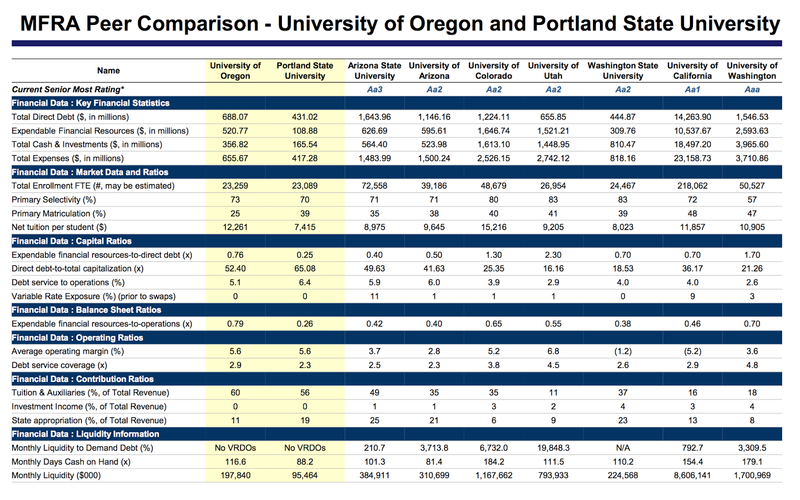 Yet Moffitt says UO can’t can’t afford an extra $12M to fund the difference between the admin and union raises proposals? Hmm. 5/6/2013: Sharon Rudnick and VPFA Jamie Moffitt have proposed $12M annually for faculty raises. The faculty union is asking for $25M. Rudnick and her team have made an impassioned plea for help finding $13M in recurring funds to make up the difference, stating that if UO can’t find the money in budget cuts, then we will have to raise tuition. So, here’s a Senate motion I’m introducing at this Wednesday’s meeting. This will yield a quick $4.5M, by cutting back on a few of the athletic subsidies that the academic side is currently paying, and requiring a modest payment from the AD for academic scholarships, limiting the pain from any tuition increases. The Task Force and the Athletic Department recommend a voluntary financial contribution by athletics to the Presidential Scholarship fund. The mission of the Duck Athletic Fund is to raise funds to offset the expenses of student-athletic scholarships and related athletic department support at the University of Oregon. 8) and, whereas in the most recently reported data, 2011-12, the athletic department paid only $7 million from these DAF funds to the academic side for tuition. Pay from its budget the full cost of providing tutoring and academic support for student-athletes, beginning in AY 2013-14. Pay from its budget the full cost of the bonds used to purchase the Knight Arena land, beginning in AY 2013-14. Each year beginning with FY 2014-15 set aside from the athletic department budget a sum equal to 2% of the athletic department’s prior year spending on athletics, and redirect these funds towards UO’s academic purposes, including but not limited to scholarship and student support services for low-income Pathways Oregon students, and academic merit scholarships. But the new hire has many years of experience as VPFA at smaller universities, and $236K seems to be the competitive wage for a university with 25,000 students and a research budget of $160M a year. Plus, the university is not taking much risk with a one year contract, and must pay accordingly. Oh wait. Sorry. The above is the deal for OSU’s new VPFA, Glenn Ford. Here at UO, our VPFA is Jamie Moffitt, and we pay her $270K. No money for faculty raises? 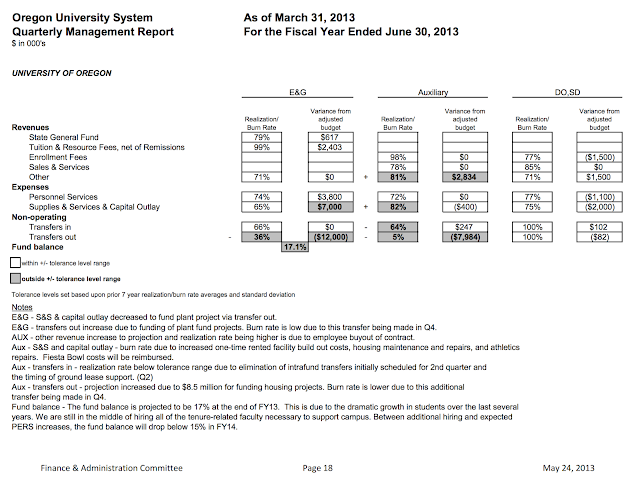 Our proposal would redirect 2% of the university’s total operating budget by fiscal year 2015. Their proposal would equate to around 1% of the total operating budget for the same period. The difference is not monumental. Yet the administration’s bargaining team was stubborn in its insistence that our proposal is too expensive. Vice-President Moffitt explained at great length the university’s revenue streams, its expenses, and its unrestricted net assets. What she did not explain specifically is what the fixed expenses cover; what the administration’s spending priorities are; and what principles guide the university’s budget policies. The information she provided gave no evidence that the administration has been rethinking the way it distributes funds. Instead, she and her colleagues propose to raise tuition in order to raise salaries. Well, tuition has been rising every year for many years, and it hasn’t resulted in increases to the instructional budget in general or faculty salaries in particular. The University of Oregon is ranked 9th out of 9 AAU comparator universities in salaries, and the administration’s meager proposal will not change this fact. We acknowledge their team’s willingness to discuss adding back compression/equity and salary floors, but we do not accept their assertion that they have no other resources to put towards our proposal. We reject their premises and methodology. We will be pushing them to take seriously the need to rethink their spending priorities and to work with us to make faculty what they say we are: the top priority. We welcome your support and encourage you to attend our next sessions on Tuesday, May 7, and Thursday, May 9. I’m sure he’s earning it. Probably more than Moffitt earned her own 75% raise – which she got after a failed search for an outside VPFA. She was on the search committee that made the call. No conflict of interest there! Tim Gleason got about 10% (and he gets a $20K stipend). While Doug Blandy’s raise was from $90K to $175K. Not a bad promotion raise: 94%. And admin bargaining team spokesperson Barbara Altmann got a 45% promotion raise over these two years. 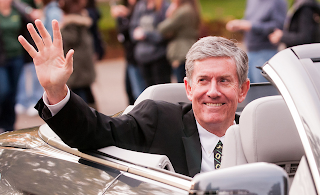 While President Gottfredson came in at a $540K salary. For comparison, the chancellor of UCLA gets $425K, after 6 years in the job. 3/25/2013: Let’s help UO’s VPFA (and former athletic department chief financial officer) Jamie Moffitt find the money to pay for the faculty raises in the Lariviere plan. Every 1% raise for the faculty (TTF and NTTF) costs UO about $910K. Add in the variable benefit costs and it’s about $1.15M. So drop baseball and we’d certainly save $1.8 million next year, enough for a 1.6% raise for the faculty. But that’s ignoring their share of the $52M in athletics department “administrative expenses”. Prorate that on the basis of baseball’s share of variable costs, $2.1M/$30M=7%, and get another $3.5M. Let’s be real conservative and call it $4.6 million in savings total. That’s enough to pay for the 4% merit pool the union is calling for in 2014-15. Thinking about Title 9 compliance? Drop baseball and we could drop Kilkenny’s competitive cheerleading program too. That would save another $800K plus admin expenses – enough to cut tuition by about $100 for every in-state student. Currently UO pays 12.21% into its defined contribution ORP for employees hired after 2003, and 22.14% for those before. That will increase to 12.41% and 26.9% in July. VPFA Jamie Moffitt told the faculty that we couldn’t get real raises because of these expected increases in the cost of retirement benefits. She didn’t mention the various bills in the legislature to cut those costs (and PERS retirement benefits). Nor did she mention this proposed legislation from OUS, which would modify the ORP that most new faculty opt into, cutting UO’s cost of retirement benefits for new hires to just 8% of salary, or 12% for those contributing at least 4% on their own. Very sneaky Jamie. 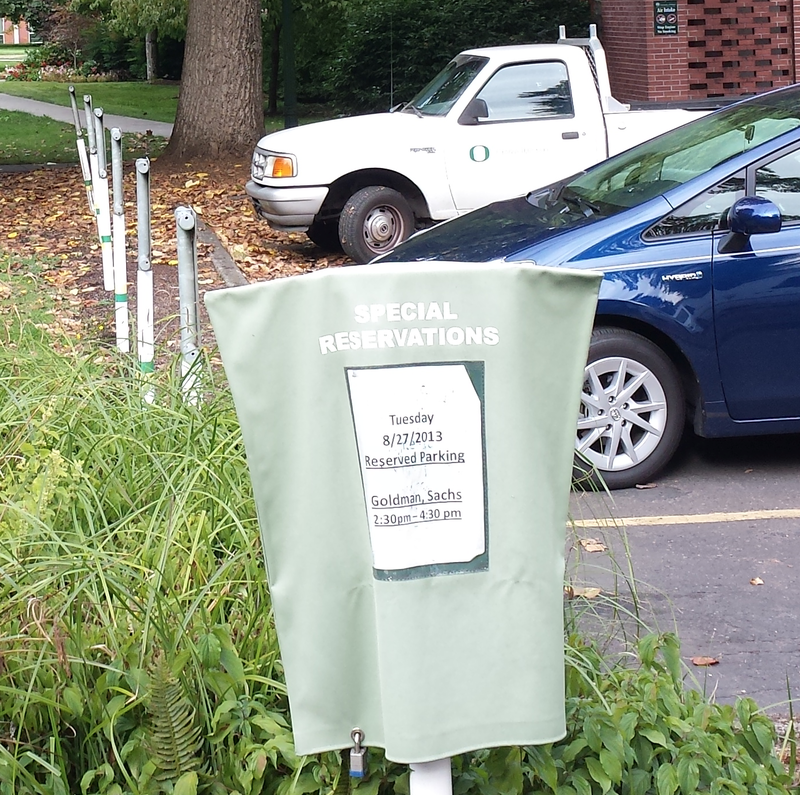 So how much would UO costs for new hires fall if this passes? Lets say from 12.21% to 10%, assuming a 50% take-up rate on the match – read this paper for more. 3/23/2013. Attached, please find the documents responsive to your mirror request for “The forecast or projection document/s that the University of Oregon submitted to the Finance and Administration Committee of the Oregon Board of Higher Education for the committee’s Dec. 21, 2012 executive session in Eugene”, made 1/2/2013. 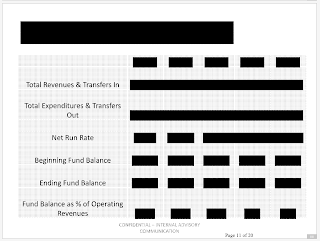 Any redactions were made under the Internal Advisory Communication exemption, ORS 192.502 (1). I’ve posted a full copy of Moffitt’s powerpoint here – but don’t bother, it’s all redacted like this. And Jamie Moffitt wants us to trust her when she tells the union there’s no money for raises? No thanks. 3/16/2013. What exactly are “the duties of the University President for the 2012 Rose Bowl”? And why did our students have to pay Lorraine Davis to go to Pasadena and perform them? missing from the list, and I will look into the matter further. Bunsis beats Moffitt with a TKO after his simple question got her so flustered she left the room. Good faculty turnout, I got $30 on cover charges so far, thanks. Bunsis presentation slides are here, video soon. Takeaway? OUS says UO should have reserves between 5 and 15% of spending. UO’s are currently at 15.8%, even after accounting for the fact that the $80 million jock budget – more than 10% of UO – has zero stated reserves. VPFA Jamie Moffitt thinks she is protecting the faculty from harsh and complex fiscal realities by making sure we only get pity raises. Gottfredson has apparently abandoned Lariviere’s “job number one” plan to get UO salaries up to to AAU peers. Presumably this means he’s also given up on keeping us in the AAU. Now Moffitt can justify giving us community college pay rates, with $200 a year potential raises for research merit. Of course the admin wants to raise our salaries, it’s just that it’s their lowest priority. Cops, guns, SUV’s, the Jock Box, Matt court parking, paying twice for Mac court, beamers, athletic overhead subsidies, sabbaticals for Bean, Jamie’s 15.8% reserve all come first. Not yet clear if the union will accept Gottfredson’s proposal or counter. My read of faculty sentiment is that it is overwhelmingly in favor of rejecting it, and making a serious counter-proposal. Prologue: On Tuesday Gottfredson dropped his 2% merit puddle ultimatum plan on the faculty without warning. Today the administrators are here in force to attempt to defend it. The union side is joined by AAUP forensic accountant Howard Bunsis. Still a few seats left at $5 per, come on down. Cast: For the admin: Kelly Wolf, controller. Brad Shelton, budget plan guy. Jamie Moffitt, VPFA. (That would be the Moffitt who got hired after a failed search, and hides athletic subsidies from the Senate, not the Moffitt who hid the CnC program from his faculty and the NYTimes.) Rudnick, Gleason, stenographers, no Geller, Blandy, or Altmann. Disclaimer: This is my opinion of what people said, were really thinking, or wanted to say but won’t until they save enough money from their administrative job to put their kids through college. Nothing is a quote unless in ” “. Rudnick: Memo from Dean on raises is not done but I will email it when ready. Start with financial context for the raise. JMoffit will present: Unusual that we would make an offer in the middle of bargaining, but we are desperate to make some friends among the faculty and think we can buy a few of you cheap. We have so much uncertainty about resources, don’t know appropriation, fees, etc. Only thing we really know is that we are going to pay Bean $320K next year to do nothing, $2 million on the jock box, $467K for Mac Court, $2.6 million for Espy’s consultants, and $700,000 or so for Rudnick and her helper lawyers. Cost of Gottfredson proposal. $11.4 million annualized – that includes admin raises, of course. $8.4m in salary, rest benefits. 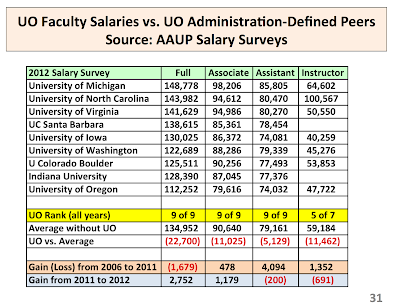 Faculty overall get %5.7 million in salary, BU members get about $4.5M (annualized). Costs: We are going to need to start hiring new faculty (15 net per year – Berdahl claimed it would be 60.) Buildings, PERS ($14.5M) health care $3M, so there won’t by much left over for you faculty. And we have no plans to try and cut our out of control administrative spending and athletic subsidies. Debt, utilities, $5M in recurring costs. Add it up, $35 million in new costs. “I don’t mean to scare people”. Please Jamie, stop talking to the faculty this way. Revenue: $9-$12M in new tuition. We’ve been bringing this in and pumping this into fund balances, as Bunsis has discovered. We project to add $14M to these balances next year. So $24M in new revenue, plus a bit more if UO Matters finds the other hidden jock subsidies. But expenses will rise long term, and we want to spend that money on cops and so on, not invest in you faculty. Bunsis: Why do you call 1.5% a COLA? Moffitt: I’m no economist, we just thought is sounded better than “Across the Board”. Bunsis: Have you looked at comparable AAU universities, like Lariviere did. Moffitt: No. We spend that money already. Bunsis: No plan: Gleason: We had a plan, Lariviere was fired, and we are going to use that as an excuse to keep your salaries as low as we can. Mauer: Do you still have the intent of getting faculty to AAU averages? Rudnick: snippy and evasive. 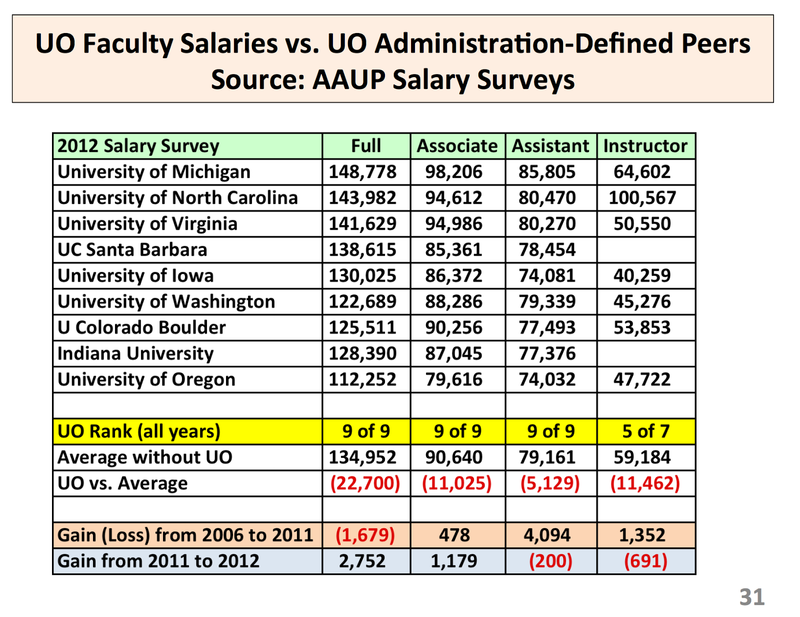 Bunsis: Will this increase in your analysis move salaries toward AAU? Rudnick: I’m not going to tell you. I just want you to accept this, or not. Mauer: Let me explain. You have a 2 part proposal, that allows external equity negotiations. So it’s legitimate to ask if you care about if it effects external equity. Rudnick: Move salaries up to “what you define as your AAU comparators”. Me: This is big news, Rudnick admits UO is giving up on AAU, hence giving up on Lariviere raise plan. Bunsis: How did you calculate benefits? 35%! Rudnick says PERS, but she doesn’t understand it. Health costs are fixed, not a function of pay. For new hires PERS is 12.5%, add in 7.51% FICA for the portion under the $~110K SocSec ceiling. 1.5% for the part above. Call it 19%. For pre 1996 hires, PERS is 22.5% plus FICA = 30% max, call it 28%. Overall, call benefits 25% of raises, not 35%. Moffitt now tries to confuse people by combining the 2 years of costs and saying it will cost 5%. Actually, 1% this year, 5.15% or so in future years. Bunsis: What sort of reserves do you really need? Moffitt: “Can I take a break?” She then walks out. One of the weirder responses to a simple question that I’ve ever seen. Mauer: Clarification: If we accept proposal, what is still subject to negoations? Rudnick: 13 is closed. 14 is anything except ATB and Merit and internal equity adjustments. Floors and external equity are still open along with things like leaves, sabbaticals. FY 15 everything is on the table. Moffitt: Things are different here in Oregon. We have carry-forward balances in schools and departments. Includes ASA, etc. Policy is that we need a fund balance of between 5-15% of operating revenue. (Jamie never made athletics do this, of course.) We are just above the maximum at 15.8% Huh? So Bunsis is right, UO is sitting on $70M. Where is it – not in my ASA! Bunsis: Some accounting stuff on unrestricted net assets. What’s the standard? Moffitt: that’s all on OUS. Mauer: We appreciate the information. Rudnick: Can Jamie leave? Bunsis: How do you deal with the swap gain on new hires? You’re calling new hires a cost, but you’re overstating the cost. Gleason: You’re numbers are drastically exaggerated! Moffitt: I haven’t calculated this, but I could. Green: Gender salary differences? Gleason: We do track that, will get it do us. Green: What about the rest of the data you’ve been promising to get for us? Rudnick: We took that job over from Randy because he wan’t doing anything, so call us and we’ll charge you $400 and hour to do his job. Rudnick: Yes, address all future information requests to us, because Randy has completely lost it. Mauer: How will we do merit for NTTF’s? Rudnick: Dept’s must submit memo on merit policies by end of March. Need to include NTTF stuff. Gleason: Trust us, we will require a justifiable rational process. “We will account for the rhythm of academic life.” “We are trying to figure out how to raise faculty salaries. It is extremely frustrating to hear you challenge our intent!” Mauer: Thanks, that’s refreshing. Of course they want to raise our salaries, it’s just that it is not our administration’s top priority. Siphoning tuition money off for the Jock Box, Matt court parking, Mac court, athletic overhead subsidies, sabbaticals for Bean, maintaining Jamie’s 15.8% reserve, etc., all come first. Cecil: We proposed 3.5% raises months ago. Rudnick: We had to wait til now because we had to pay off all our other costs first – you guys get what’s leftover. So, you gonna take it? Cecil: You say you are trying to be collegial, so why won’t you talk with us about the terms? Rudnick: We are sorry we sprung this on you. The possibility of raises came up suddenly after Bean got fired. If you can get Geller and me fired too, maybe you’ll get more. Gleason: “This is urgent, we have to start the process now” because we stonewalled for so long. Rudnick: We hope we give you a memo today, maybe we can then have a secret conference call to talk through any issues. Quick break. We’re not going to get a resolution on the puddle raises today. Mauer: Union counter on grievance proposal. I’m snoozing. Art 6: Union counter on dues deductions: Admin doesn’t want to be responsible for deducting the proportion of dues that go to union politicking, e.g. lobbying Salem for more higher ed money, claiming that’s too complicated for HR to do. Nope, it’s simpler for HR to do it. (Not to say it’s the right thing, just that it’s simpler.) Rudnick: Suppose a faculty member with a religious objection sues us for deductions. Cecil and Rudnick. More back and forth. Union’s lawyers are cheaper than your $400 an hour, we are not going to pay you. Drop dead. Rudnick: I’ll think about that. Mauer: standard language. Rudnick: I understand you don’t want to write a blank check, I get it, will consider. Art 8: Union counter on non-discrimination. Snoozer. Art 5: Union counter on Union Rights: Union is giving up right to make a presentation to new employees? Why? I sure wish someone had explained what the hell is going on with our administration back when I got hired. Instead I got a lecture from Lorraine Davis. Today, 3/6/13. I’ll try and live blog it. The union’s need to respond to Gottfredson’s mini-raise ultimatum by next week has raised the stakes for this considerably. 3/2/13: Our JH contacts report that their bosses are going to plead poverty when the Union starts putting forward salary proposals in a few weeks. AAUP lawyer and forensic accountant Howard Bunsis has been tasked with searching their pockets. This will be his third trip to UO, during his last two he ran circles around VPFA Frances Dyke and Interim Provost Bean with his data and presentations. New VPFA Jamie Moffitt is a tougher nut, given her years of experience hiding Duck athletic department subsidies from the faculty. But my money is on Bunsis. And so is yours. Ad here. Anyone know who’s on this search committee? The inside candidate is Pete Deshpande. Ms Moffitt’s non-explanation of why she suddenly fired Public Safety Director Doug Tripp is here. Tripp apparently has a new job in Florida, which will should save us $90K or so on the year’s severance pay. And the latest transparency update from police.uoregon.edu is here – it’s from Francis Dyke, in Jan 2010. Brings back some memories, that does. Last I checked UO was paying its public safety director more than the City of Eugene was paying its Police Chief Pete Kearns. Presumably the push for guns will yield another big raise. No worries, Moffitt has plenty of money for this sort of stuff, and is happy to spend it if it will make her job easier. Just don’t ask her to help pay the startup for some physics professor.